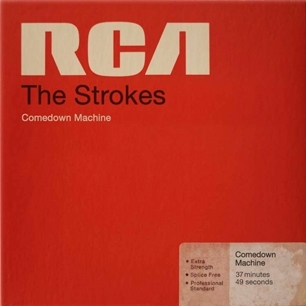 “You asked me to stay, but there’s a million reasons to leave.” So sings Julian Casablancas on “One Way Trigger,” the first single off of The Strokes’ new album, Comedown Machine. Trust me, I know the feeling. Being a fan of the Strokes is what I imagine it must be like for Chicago Cubs fans; through all of the frustration and anger, there’s some kind of hopeless faith that keeps you coming back year after year. I used to say that the Strokes were my favorite band because it seemed like the cool, edgy thing to do. Now I say it nostalgically, hopeful for the day when my faith in Casablancas and the boys will be fully restored. I’m not sure that today is that day. Don’t get me wrong; Comedown Machine is lightyears ahead of the band’s previous album, Angles. A large part of that has to do with Casablancas. Whereas Angles split up the songwriting equally among the five band members and had Casablancas recording his vocals at a separate time, Comedown brings him back to the front and center, writing a majority of the songs and recording with his bandmates. The result is an album that sounds more cohesive, incorporating all elements from all of their previous efforts. At this point, I’ve just accepted that The Strokes are an ever-evolving band. Some of their songs will sound like they’re straight off of Is This It, (Comedown Machine’s highlight, “All the Time,” is the first song in a long time that’s had me playing air guitar and drums simultaneously) while some will present us with Casablancas doing his best Thom Yorke impersonation, hitting falsetto notes that we’ve never quite realized were possible.